I’ve never been to Fenway Park, but it looks like a great place to see a game. Sure, it’s ancient, but it’s also very historic, with the Green Monster and Boston’s notoriously fun fanbase, it looks like it might be a good time so long as you’re not a fan of the other team and make sure to look out for bats. No, not flying bats, flying bats. As in baseball bats. 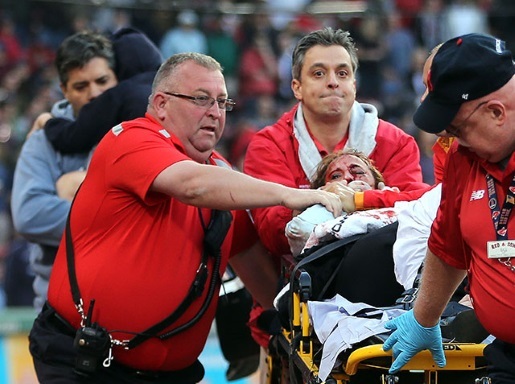 A female fan was struck and bloodied by a broken bat at Fenway, being wheeled out on a stretcher after her injuries. Apparently her screams were audible during the WEEI radio broadcast. The horrible accident took place in the second inning of tonight’s game (that’s Friday night). Boston’s Wade Miley was pitching to Brett Lawrie of the Oakland Athletics, and Lawrie’s bat shattered. The fan was hit by a piece of the bat and bloodied. A police officer consoled the small child that was with her while paramedics attended to her, transporting her to a local hospital for treatment. The game was delayed while medical personnel attended to the woman. Here’s hoping everything’s okay. The woman didn’t lose consciousness during her ordeal, which is good, but she was screaming quite a bit, so hopefully nothing major happened.